Getting an exact quote is fast and easy. Just as if you were placing an actual order online, toss the item(s) you want in your cart. As long as you create an online account first or when you check out, one of your options (under "payment type" will be "Save As Quote". Just click that box, name your quote and click "Checkout". That's it. Your exact quote is in your email inbox. When approved, you may purchase online or give us a call with your payment info: 888.475.5999. 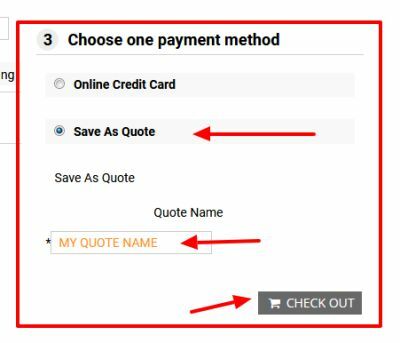 When you're ready to convert your quote to an order, you may click "re-order" online or give us a call with payment info.